On the front panel, these units have three lights and four buttons. The status of the printer can actually be determined by what the lights are doing. The top button is the “Cancel” button, the second is a printer cartridge status light. The third one down is the “Resume” button and light, and fourth is the power button and power light. 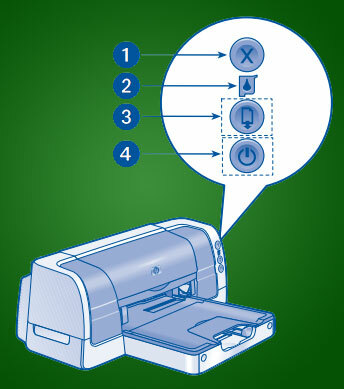 If the print cartridge light is flashing, there could be two issues with your machine. The first is that the top cover of the printer may not be closed properly. If that is the case, close the top of the unit completely. The second is that the ink cartridges are empty, or are not installed. You should have an HP 78 and an HP 45 cartridge in place. If you believe they are not empty, try removing and reinstalling the cartridges to see if the flashing stops, otherwise, replace the cartridges. If the resume light is flashing, the problem is related to the paper. It could be that the paper tray is empty, or that there is a paper jam. Check the paper tray and refill it if necessary. Also try removing the paper and reloading it into the tray. If you aren’t out of paper, there is probably a paper jam, so try to clear the paper jam and/or remove any fragments of paper that may be stuck. Once the paper is loaded properly and you have cleared any paper jam, press the “Resume” button to continue the print job. If you find that you are consistently experiencing paper problems, see our article on Preventative Paper Care. If your power light is flashing, this isn’t a problem, but simply an indicator that your machine is preparing for a print job or in the process of printing. When the light stops flashing, the print job is complete, and it is ready to print again. If all your lights are flashing, don’t be alarmed. Most likely, a communication error has occurred and the printer will just need to be restarted. To do this, turn the printer completely off and disconnect it from power for at least 10 minutes. Then, plug the printer back in and turn it on. Despite the lack of an LCD screen, it is impressive that the Deskjet 6100 series is capable of relaying the most important errors to the user using only a few indicator lights. If, after trying the solutions in this article, you are still experiencing flashing lights that indicate an error, you should probably contact HP support for more assistance.